Facebook was bombarded with complaints that minors spent large sums of money playing games like Angry Birds and Ninja Saga on Facebook, while having no idea they were blowing ‘real’ cash, internal emails show. For years, the company tried to tackle the issue of kids unwittingly spending large sums of their parents’ money by playing games on Facebook, newly unsealed court documents say. In 2012, an Arizona woman sued the tech giant after her 12-year-old son racked up around $1,000 in credit card charges while playing Ninja Saga. She claimed that neither she nor the boy knew that they were spending money on the game. The company eventually settled the case with the family. This was far from an isolated incident. Facebook’s internal emails describe how another family requested a refund after a 15-year-old accumulated more than $6,500 in charges playing an online game. The company was concerned with the influx of refund demands as chargeback rates for games on Facebook went as high as nine percent – well beyond what is considered a ‘red flag’ by the Federal Trade Commission. Game developers also raised concerns. At one point, Rovio, the creator of the massive hit Angry Birds, emailed Facebook asking about the refund rates of “5-10 percent” for money spent on the game, which seemed “quite high.” After analyzing the situation, Facebook concluded that more than 90 percent of refund requests for Angry Birds were filed after a minor used their parents’ or grandparents’ account. Internal probes further found that in many cases, minors had no idea that they were paying real money, and their parents did not realize that their credit card was tied to Facebook. “This only exacerbates the problem since it doesn’t necessarily look like ‘real’ money to a minor,” an employee wrote, according to the internal emails. 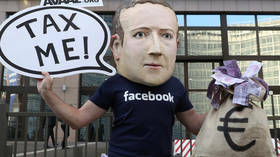 The use of such language coupled with the fact that in at least one exchange a Facebook employee referred to a user seeking a refund as a “whale” (casino slang for a high-wager gambler) led some media to accuse the tech giant of turning a blind eye to the problem or even encouraging minors to squander vast sums of money online. Yet, in a statement provided to the Center for Investigative Reporting, which reviewed its emails this week, Facebook noted that it “routinely” examines and revises the terms and practices with connection to refund requests. “Facebook works with parents and experts to offer tools for families navigating Facebook and the web,” the company said, adding that it agreed to provide “dedicated resources” to deal with chargebacks originating from purchases made by minors. The latest buzz adds to a number of controversies that have piled up on Facebook in recent years. The company was previously entrenched in a high-profile data-mining scandal and accused of not doing enough to combat the activity of false accounts and disinformation online (which Facebook denies).